Animal art isn't just for kids — although, admittedly, one of the examples shown here was created just for them. But from Warhol to wild horses, there are a lot of sophisticated works that can complement the design of almost any room in your home. Make it pop. 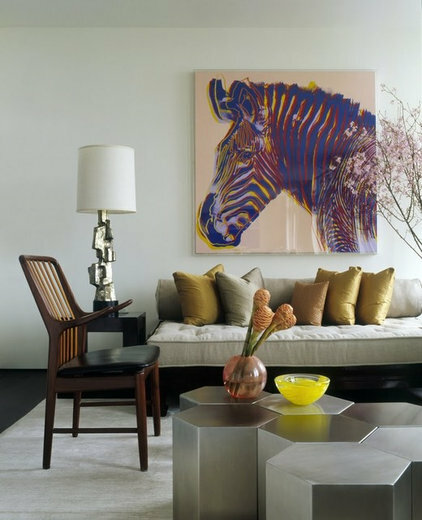 This piece was in the owner's private collection and is an original Andy Warhol zebra print. 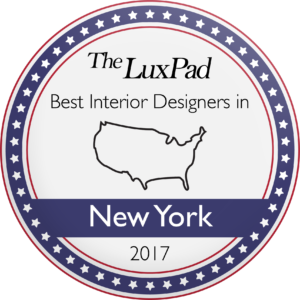 "Because it was such a prized piece, we placed it prominently in the living room and used it as color inspiration, pulling out tones for the pillows and accessories," says designer Gabriel Benroth of Incorporated. "The owner chose this piece for its more subdued colors when compared to the hot pinks and aqua blues of other Warhol zebra prints." Allow serendipity to strike. "We had a hard time finding the right piece for this room," says designer Dona Rosene. 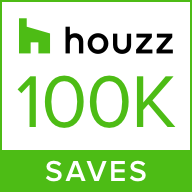 "Initially, the client didn't think the space was that important, and she had a limited budget for it. Then one day she walked into Domain in Fort Worth [Texas] and instantly fell in love with this painting and its size. She says it was an emotional response and bought it within five minutes despite the price." 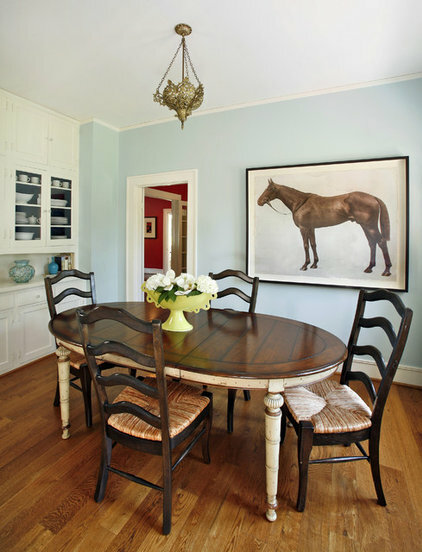 Rosene's client told her, "It was meant to be that we ended up having a prominent picture of a horse where my daughter eats her breakfast every morning. She was born horse crazy, has been on horses since she was 18 months old, and has been taking riding lessons for over a year now." Play with sophistication. For this beach house design, Tara Seawright wanted to bring in items the client's two small children could relate to. "It started with a fabric in the living room that had turtles swimming on it — but it was something adults would like too — and animals just started appearing in objects, lamps and artwork," she says. "But when you walk into the house, it doesn't feel like an animal kingdom. It's more of an unconscious, playful kind of thing, and this piece by Jeffrey Rothstein met all my requirements because it was sophisticated but had fish. 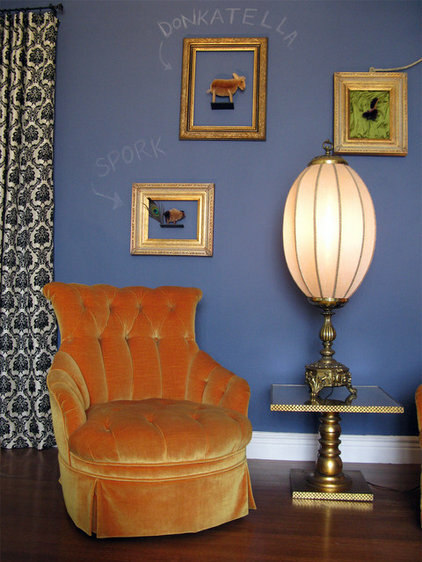 It wasn't too literal, and it's a beautiful piece — bright and approachable," she adds. Climb every mountain. These prints by Joe Andoe were purchased from the Julie Nester Gallery in Utah. Momoko Morton of Naka Designs, who designed this space along with partner Robert Fitzgerald, says, "Our goal was to create a contemporary mountain look using traditional mountain imagery, finishes, textures and colors in an updated way." She adds, "Our clients, who were Chicago doctors, wanted the space to be modern, crisp and white. But after a number of years of designing in the mountain towns of Colorado, we've learned what people want and expect when they come to visit, and we wanted to be sure our clients' condo/part-time rental property would be highly coveted. So we met in the middle and created a space that is unexpected, luxurious and warm." The images by Andoe "were a perfect addition to the space," she says, "with the unexpected punch of color in contrast to the cool gray paint and Paul Smith for Maharam headboard fabric." 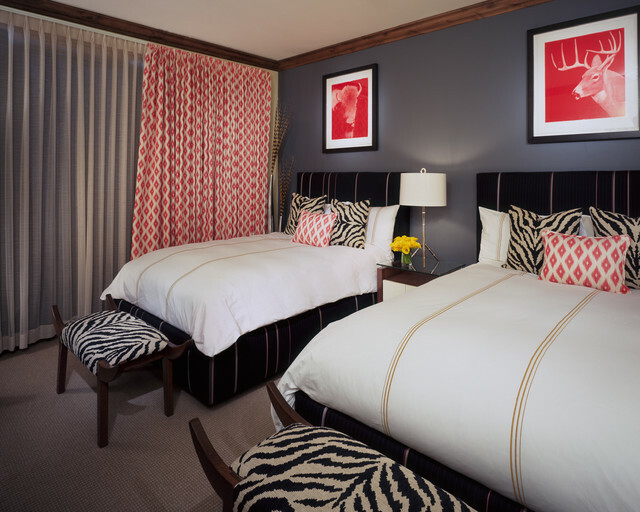 by Jenna Wedemeyer Design, INC. Pick up a souvenir. For this family room, Jenna Wedemeyer took inspiration from the homeowners. "I love this piece because it's a work the clients bought on a trip to Antwerp [Belgium]," she says. "It's a constant reminder and reflection of their life experiences and not a reflection of me as a designer or something impersonal or store bought. It gives the room its soul." Create a custom work. "We created three wallpapers with animal prints for three boys' bedrooms," says designer Jarlath Mellett. "Each has a different theme — jungle, ocean, desert — and we took images of animals and then created custom wallpaper by scanning fashion and interior fabric patterns to color in the animals." 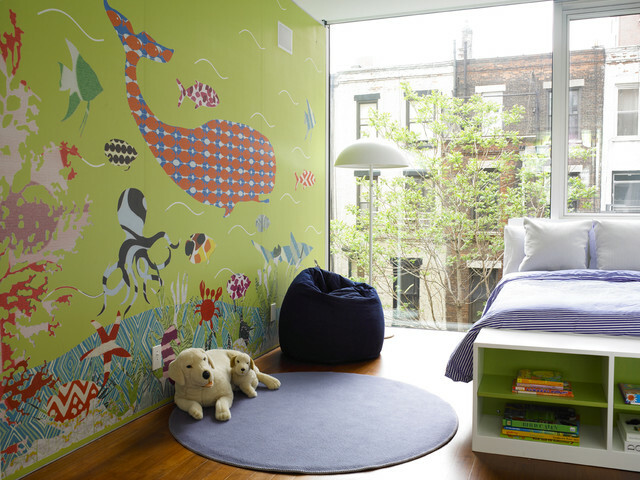 He adds, "Each wallpaper is meant to be a piece of timeless art for the kids to grow into and was based on their individual interests. It provides them with a whole world to live in and spark their imagination." Embrace the elements. 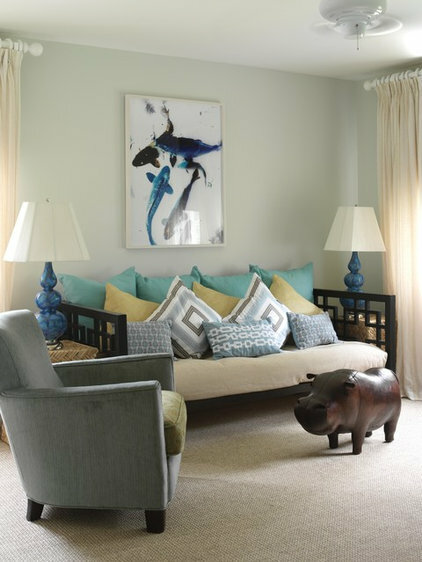 These homeowners are nature and animal lovers, and designer Marie Burgos felt it was important to choose art that made them happy and comfortable. This work by Patrick Wright is called "Passing By." "I use the principles of feng shui in all of my designs regardless of whether I'm adopting a contemporary, eclectic, modern, tropical or rustic look. In order to apply feng shui, I use the bagua, which is an energy map. It gets applied to the floor plan, and I always place the emphasis on using a great open layout for the chi energy to circulate freely. I also utilize the two opposite forces of yin and yang to create balance, and the five natural elements (wood, fire, earth, metal, water) to create harmony," Burgos says. "Animal art is a way to integrate a natural element in a stylish way. In this case, the horses, which are a noble animal with great energy, bring a spirit of openness and freedom," she adds. 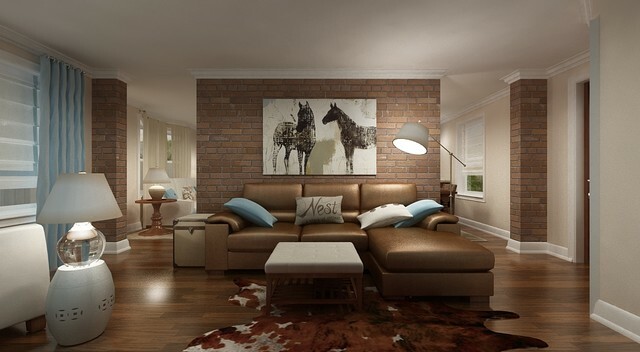 "In this family room, I opened the wall on either side to make the space flow better but wanted to keep the original brick wall for more texture and authenticity. 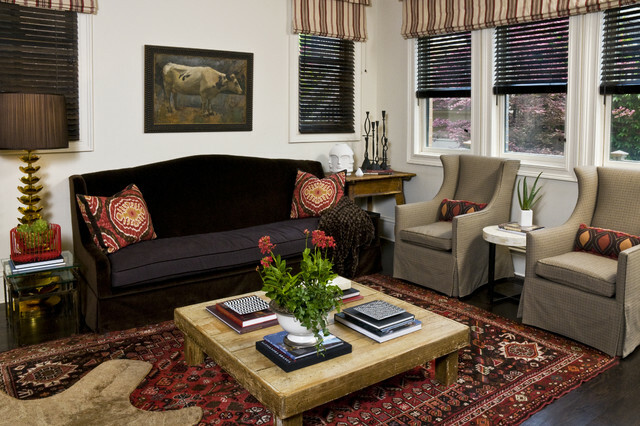 The horses give this room life and a unique character." Supersize it. "It’s important to me to show each homeowner’s personality in an interior," says designer Kimball Starr. 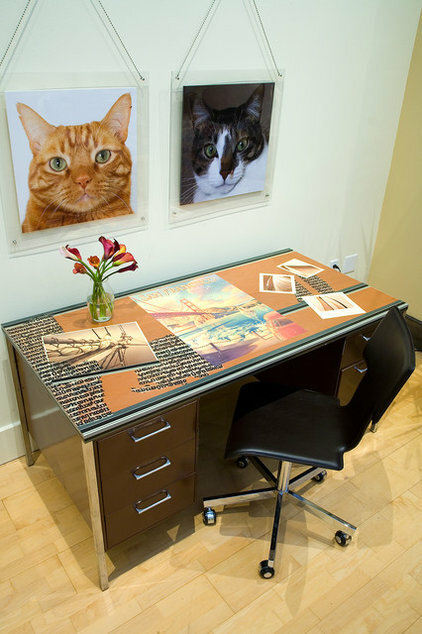 "For this client, his cats are his family, so I wanted to honor that by giving them prominence. I had their portraits photographed and supersized and then displayed their faces where he can enjoy them every day." Be sure to have fun. Here's another room by Kimbell Starr that’s actually in her own home. "Those bristle-brush animals would sit on my desk and always make me smile," she says. "So I decided to display them as if they were museum pieces. I named the donkey Donkatella and the pig Spork, and wrote their names on the wall, the way a museum would display genus and species of an animal, but in my own modernized, lighthearted way."